Simple story – 5 year old boy playing with his 6 year old sister on bunk beds. Mum heard a thud then a scream and found him on the floor – he has fallen about 1 metre onto his outstretched arm. No other injury seen. On arrival to the ED he is holding his arm by his side in 90 degrees flexion, when asked – he points to his antecubital fossa to show where he is sore. He has good pulses distally, there is some localised swelling but no deformity of the elbow. 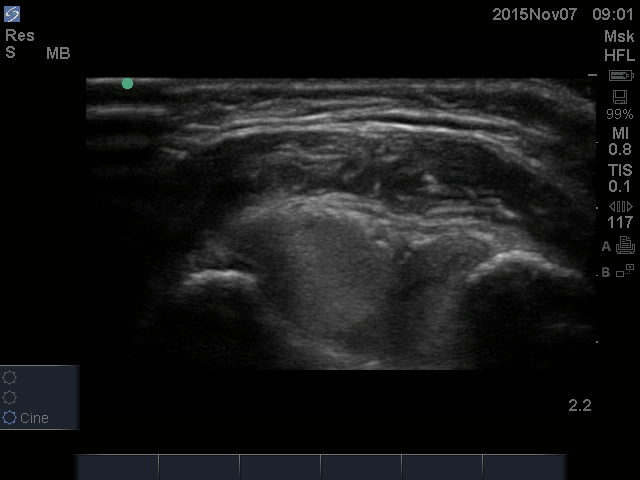 First view is a transverse of the posterior humeral condyles and fat pad. The is abnormal – usually the fat pad lies beneath a line, convex down between the condyles – this pad is billowing up – this is a sonographic “sail sign” the tell tale for an elbow haemarthrosis. The second image is a long view of the posterior humerus with triceps tendon overlying. There is a subtle cortical break evident (can you see it?) These can be tricky as they look a lot like normal growth plates in little kids – so luckily he has 2 arms and we can scan the other one to compare. Asymmetry suggests a fracture – you can also use the probe to illicit tenderness to check fracture vs. growth plate. The third image is a long view of the proximal radius – checking for a fracture of the radial head – this was normal. The other side looked the same and there was no tenderness over the radial neck. The elbow was enlocated on further scanning. So we have a good story for a supracondylar fracture, a definite haemarthrosis, a subtle crack in the distal humerus and a normal looking radial head/neck. So the subtle signs are seen – but I reckon they are more obvious on the US. What do you think? ? So a few controversial questions…. (1) Do we really need to Xray this kid? It is a subtle undisplayed fracture which will always be managed conservatively. (2) If the plain film had been reported as “Normal” or “non-diagnostic” what would you do given these US images? And here is the 2012 paper by Rabiner et al [Crit US Journal ] that showed a 98% sensitivity for detecting elbow fractures. The specificity was only 70%, against Xray as a god standard. So beware of overcalling these? and of course there is no USS yet at Kilcoy Hospital. Interesting to see the shape of cartilagenous cover of the joint-end-of-the-bone (always get my physes mixed).